1) Moderated the Chula Vista Genealogical Society Research Group meeting on Wednesday, 12 September, with 14 in attendance. I discussed the updated improved AncestryDNA ethnicity estimate, the updated FamilySearch Family Tree profiles, and how I use Web Hints to add content and sources to my RootsMagic family tree database. The attendees discussed their research, family history and DNA efforts over the past month. 2) Did a final edit on the WDYTYA project presentation researching the ancestry of a local personality, which I will present at the CVGS Family History Day on 29 September with him and his family in attendance. I worked on this RootsMagic family tree during the week, which now has 590 persons with 1,649 citations. I TreeShared it once, and resolved several pages of Ancestry Hints. I also created the syllabus for this presentation. 3) Did a final edit of the DNA Overview presentation and syllabus to be given on 29 September at the CVGS Family History Day. 4) Watched the "Examining Migration & Researching Migrants in the British Isles" webinar by Julie Goucher on Family Tree Webinars. This was about immigration to the British Isles rather than emigration from the British Isles. 5) There were several sessions working in RootsMagic to update FamilySearch Family Tree profiles for Seaver families and other database families, with occasional additions to the RootsMagic profiles. I have matched 26,017 of my persons with FSFT. I continue to use Web Hints from Ancestry, MyHeritage, Findmypast and FamilySearch to add content and sources to my RootsMagic profiles. I now have 50,779 persons in my RootsMagic file, and 96,071 source citations. I TreeShared twice during the last week, and resolved over 400 Ancestry Hints. I've fallen behind on the Ancestry Record Hints with 76,151 waiting to be resolved, but I work on them occasionally. 6) Have 307 Shared Ancestors on my AncestryDNA list (I had 303 last week), 981 4th cousins or closer (I had 973 last week), and 890 pages (over 44,450 matches with at least 6 cM) (was 883 pages last week) of matches. I have 23 DNA Circles (was 23 last week). I have 16 matches that are third cousins or closer, and 103 matches with 34 cM (0.5%) or more (was 103 last week). My highest match has 779 cM (11.5%), and is one of my first cousins. 7) Have 4,534 DNA Matches on MyHeritage (up from 4,464 last week) with at least 8 cM (0.12%), with 27 matches with more than 34 cM (0.5%) or more (was 26 last week). I have three close relatives, including a first cousin once removed, and two first cousins twice removed. The highest DNA match is 512 cM (7.1%). 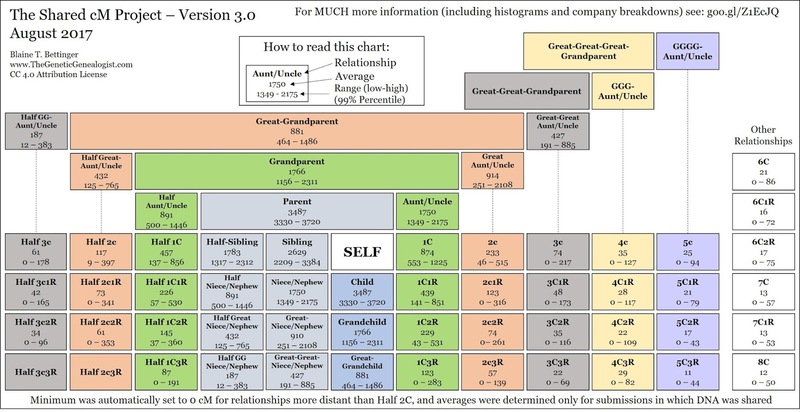 8) Have 990 DNA Relatives on 23andMe (I had 992 last week) who share at least 0.10% (7 cM) with me. The two closest relatives are third cousins. Of these, only 3 share 1.0% or more, and 48 share 0.50% or more (was 48 last week), with the highest match being 1.54%. My highest match is an adoptee. I struggle to find out anything about most of these testers. 9) Have 2,781 autosomal DNA Matches on FamilyTreeDNA (up from 2,768 last week) who share 0.25% (18 cM) or more, with the highest match being 96 cM (1.42%). I have 12 who share at least 1.0% (68 cM) with me, and 1,499 who share at least 0.50% (34 cM) or more (was 1,492 last week) with me. 10) Wrote 16 Genea-Musings blog posts last week, of which two were press releases. 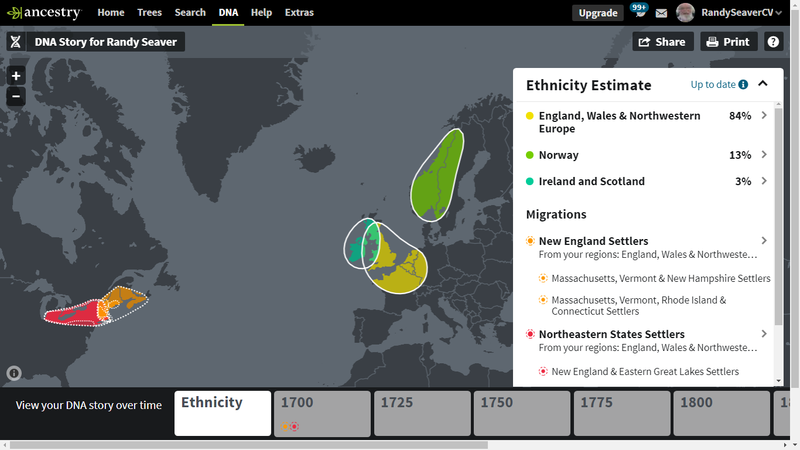 The most popular post last week was "AncestryDNA Updates Ethnicity Estimates for Everybody, But ...My Wish List" with over 295 views.